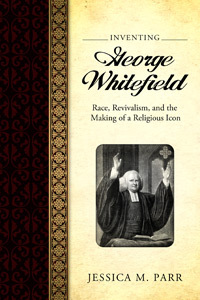 Books – Jessica M. Parr, Ph.D.
My first book, Inventing George Whitefield: Race, Religion, and the Making of a Religious Icon, was published by the University Press of Mississippi in March 2015. The paperback was released in the fall of 2016. The book began as an exploration into the controversy over catechizing African slaves in the British American colonies, and Whitefield’s role in the conversion of enslaved Africans. (Many clergy believed that Africans did not possess human souls, and some believed conversion of slaves would make them defiant.) As research expanded, the project grew into studying larger questions about Whitefield’s significance in the British and Black Atlantic Worlds, and the persistence of his image. I argue that Whitefield was a trans-Atlantic icon shaped in the complexities of revivalism, the contest over religious toleration, and the conflicting roles of Christianity for enslaved people. Evangelical Christianity’s emphasis on “freedom in the eyes of God,” combined with the problems that the rhetoric of the Revolution posed for slavery, also suggested a path to political freedom. My exploration of the evolution of Whitefield’s pro-slavery thought and its reconciliation with his religious influence on anti-slavery figures like Olaudah Equiano, along with my application of memory studies to understanding how Whitefield evolved as an icon, are among the book’s central contributions. The book uses a lens of memory to assess (and reject) the frequently nationalist, hagiographical treatments of Whitefield. The paperback will be released in November 2016. My current book project, tentatively titled “To Drink Samaria’s Flood,” explores the evolution of religious thought in the Black Atlantic from 1760-1830. I am using slave narratives, pamphlets, and other materials to explore the the development of what I identify as three (sometimes interconnected) threads of African-American through on slavery and freedom. I see one thread that is primarily concerned with redemption of slavery. Another focuses more specifically on the American Revolution and the future of enslaved Africans. The third is a jeremiad, that reflects back on the failure of the Revolution to address slavery, in some cases, warning white pro-slavery Christians about the soul of the young republic.